Just because something feels right or good doesn’t always mean we should follow it or do it. It may be good to ask for more direction or read the signs before moving forward. When you walk down the hallway where the bathrooms are at the nearest Chili’s, which I’ve done a hundred times over the years, the women’s restroom is on the left and the men’s is straight ahead. But when you walk down the hallway marked “Restrooms” at Jason’s Deli, the one on the left is NOT – I repeat – NOT where they keep the women’s restroom. If you’ve read this blog before then you know I’m talking about more than bathroom signs. You’re probably already thinking there are at least 20 better pieces of advice or responses that could follow that. The problem I had with this experience was that I listened to a man (and someone I respected at the time) over what I kinda already knew to be true. And I believed that I probably “heard” God wrong for a few more years. The only reason I can see to tell people they’re wrong about God Calling them is jealousy or maybe ignorance about the truth that the Holy Spirit actually does what God says He does in the Bible and that He actually DOES live in us and He actually DOES guide us every day. He actually interprets for us when we talk to God and aren’t even sure what to pray. If you feel God is leading you to something, please pray for more confirmation and ask other believers to pray with you, too. I believe many of us miss out on Supernatural and Divine work that God’s got for us simply because we are listening to other people tell us it’s not possible that God actually works in ways He says He does. God can take things we think are impossible and make them completely 100% possible and real. And He does this with everyday people like you and me. Believe His Promises. If people tell you God only uses teachers, preachers, and Bible scholars, then maybe they’re missing the fact that Jesus chose regular people to walk with Him and perform miracles. He could have chosen anyone, right? God’s got a plan for your life no matter who you are or what you’ve done. Ask Him for more confirmation. And I’ll be praying, too. When I started asking God what HE wants ME to do every day instead of showing HIM that MY stuff was so important and my “to do list” was more important than whatever He had in mind, do you know what He did? He has been giving me everything I need to do the job He’s asking me to do. He’s been leading me and equipping me every day. One thing He’s done is that He gave me confidence. WHO can give the gift of confidence? I can’t. You can’t. I mean, we can help lift each other but to actually GIVE the GIFT of confidence? Who can do this? I can only think of ONE. WHAT a great hiding place! They’d never think to look under here! Thanks uncle. I didn’t move. I knew if I moved then they’d find me and then I’d lose the game of Hide and Seek. That’s how innocent I was. That was the beginning of many years of satan convincing me I was nothing. That little devil was busy at work to make me believe his lies. I must have been quite a threat for him to work so long on me. Maybe you are a threat to him, too? God allows bad things to happen to people. I don’t blame God. We all have free choice to eat the fruit the same way Adam and Eve ate it. And we all have the same free choice every day NOT to eat it. I have even forgiven my uncle and I am still not going to have my children around him. That would not be wise. (I’m not arguing this point with anyone.) This is my choice because I am my children’s mom and God does expect us to use the discernment He gives us. See this picture of our table? There are many names on it. (Maybe I’ll write about why we let people sign our kitchen table in another post.) This can represent my heart and people who have come and gone through my life. Some have faded and some are bold, still. They ALL are written there for a reason. 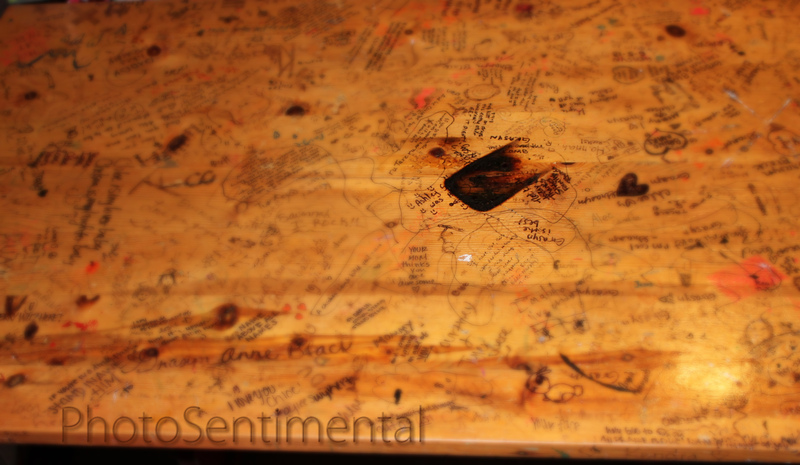 Now let’s talk about that big, black, burn mark in the middle of the table. That burn mark is something that everyone sees or senses… but many of us don’t speak about it in our lives. If I don’t talk about it because that’s uncomfortable or it would make someone else feel uncomfortable (especially at church because unfortunately that’s usually frowned upon and people are often gossiped about when we DO have courage to share our stories) then quite possibly the pain, and the wisdom I’ve gained through this pain, isn’t being used to help others. I’ve been burned, right? God takes those very ashes and makes them into something beautiful that He will turn back around to glorify Him. He will use my pain and not waste it. I have peace in this. You can have peace in your pain, too. What God has been leading me to do (well, part of it) is to be online (which is more than a few zip codes out of my comfort zone) and speak blessings over people, challenge them to ask themselves “WHY” they believe and do what they believe and do, and then the bigger one of moving to Alaska to open and care for a homeless teen place. I could not do this on my own. Ever. Period. Any of it. UM, THAT’D BE A QUICK, “NOPE. I’m not going there!” There’s no going back. Submission to God’s will and plan for our lives can actually be a fun thing. It’s very exhausting and trying at times and sometimes it’s lonely. But this is so worth it. It’s fulfilling my soul in a way that’s never happened before. God will use YOUR pain for His glory. Your pain will not go to waste. Ask God, the Creator of YOU, the Creator of all your talents, of all your likes and dislikes, what HIS plan is for you today. He KNOWS you. He LOVES you. He’s got wonderful plans for your life. Do you have the courage to just ask Him to show you those plans? I know you do. He will make beauty from your ashes.